The business of IT continues to evolve, driven by cloud computing, big data, and mobility, and fueled by organizations looking to technology to deliver new innovations and reshape customer experiences. As a result, it is increasingly necessary for organizations to leverage the next generation of IT infrastructure. To do this, IT leaders must build a strategy for the future of IT services, while at the same time, they need to explore which consumption models will deliver the best value for the business. 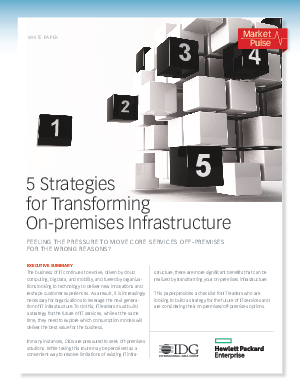 In many instances, CIOs are pressured to seek off-premises solutions. While taking this route may be perceived as a convenient way to resolve limitations of existing IT infrastructure, there are more significant benefits that can be realized by transforming your on-premises infrastructure.